In 2009, Pazazz Performers owners/directors learned that one of their 3-year-old students, Arianna Dougan (nicknamed Ari), had been diagnosed with neuroblastoma. Arianna loved to dance, but with her immune system weakened by chemotherapy treatments she was forced to stay home and miss her beloved dance classes. But that didn't stop her dance teachers, Kacy Voskuil and Emily Edwards of Pazazz Performers of St. Louis, from bringing dance lessons to her at her home. At the same time they had heard of the work of the Andréa Rizzo Foundation and hoped that they could bring Dréa's Dream pediatric dance/movement therapy to the hospital where Arianna was being treated so that she could enjoy dance and movement right there in her hospital room. That was the beginning of Pazazz's brainstorming with the Andréa Rizzo Foundation and planning fundraisers like dance-a-thons, dance parties and finally, a huge Dréa's Dream Gala. After raising their first $5000 they worked with foundation president, Susan Rizzo Vincent, to bring Dréa's Dream to Cardinal Glennon Hospital where Ari was being treated. From that point on there was no stopping Pazazz Performers! Their efforts to continue to raise funds in many creative ways flourished and the progr am has expanded from 1 hour per month of pediatric dance therapy to 12 hours per month. All the while, Ari remained their biggest inspiration. Susan Rizzo Vincent has been deeply touched by this special effort. After meeting Ari several times over the years and especially two years ago when she watched Ari, (only 10 years old at the time) step up onto the stage of the Edison Theater at Washington University during the annual Dréa's Dream Gala and speak about how Dréa's Dream was helping her get through her cancer battle and also helping the patients that surrounded her while being treated at Cardinal Glennon in St. Louis, it was clear to Susan and everyone in the audience what propelled Pazazz Performers to go "all out" to bring Ari the gift of dance/movement therapy. On March 10th , the Pazazz Performers of St. Louis will once again host their spectacular Dréa's Dream Gala and all in attendance will have their hearts and minds on Arianna Dougan. Click here to watch their video (that features a poignant speech on stage last year by Arianna) to see how Ari and Dréa's Dream grew through the years because of Pazzaz dancers' compassion for others and a strong love of dance. Pazazz Performers have let their hearts move their feet and made big things happen for so many. 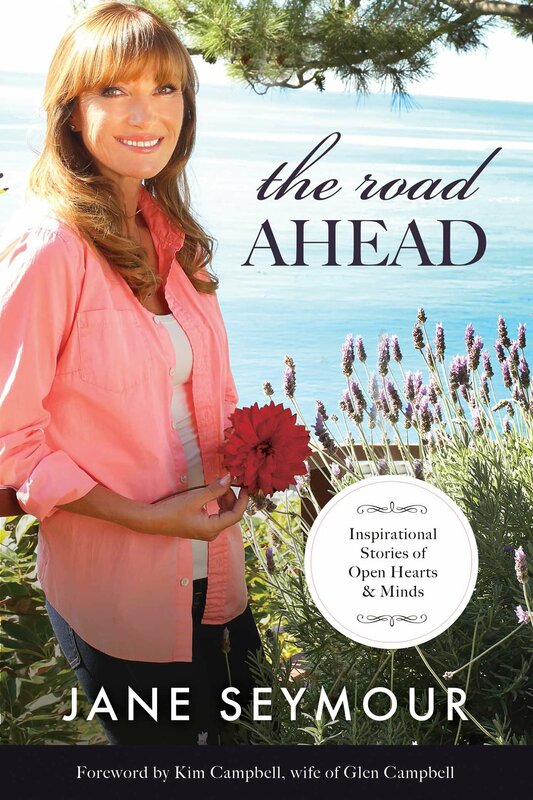 WPRO Radio Host, Patricia Ruskin, interviewed actress Jane Seymour recently and they discussed her new book The Road Ahead. Foundation President, Susan Rizzo Vincent was invited to speak as well since the story of Dréa's Dream is included in this beautiful book of overcoming life's challenges. A must read! It's the little things that make a difference for a pediatric cancer patient. These beautiful beanies were made by a very special woman, Nina Frances of Gloucester, MA, to be donated to our young patients at Memorial Sloan Kettering Cancer Center. She also made a batch for our patients at Connecticut Children's Medical Center. When Nina heard about the foundation's work, she immediately wanted to help in some way. She said, "I want to do something for the Andréa Rizzo Foundation but all I can do is knit. How about beanies to keep their little heads warm?" As you can see from this photo, Nina Pickett, Administrator of Pediatrics at MSKCC, was thrilled and in awe of the beautiful work that Nina Frances put into these special gifts and is delighted to think of all the smiles that will appear when each child is presented with a beanie. Nina Frances, you could not have given a more special gift and we know that each knitted stitch is filled with love. Thank you from the foundation and all of the children who participate in Dréa's Dream pediatric dance therapy program. We're right in the middle of the Dance Across America 2017 - 2018 season and could not be more inspired. Many of these dance schools create special events year after year, and counting. March 4 - Mansfield, MA - On the Barre will hold their benefit performance at 1pm, Mansfield High School, in conjunction with Revolution Performing Arts, Dance Express, Live, Love Dance Studio, In Sync Center for the Arts and Kalia Karr Dance Studio. They will be dancing to raise money for the foundation. What a group! March 8 - St. Louis, MO - Pazazz Performers 8th Annual Dréa's Dream Gala. This dance school just keeps going and going. It's truly an inspiration. See above story about this incredible company. March 24 - Marshfield, MA - Stephanie Holleran, Owner/Director of Duval Dance and Music Academy will hold their annual benefit at 6:30pm at the Elks Club.